True to form, the latest signing to London’s XL Recordings is poised to soulfully shake up the pop world. 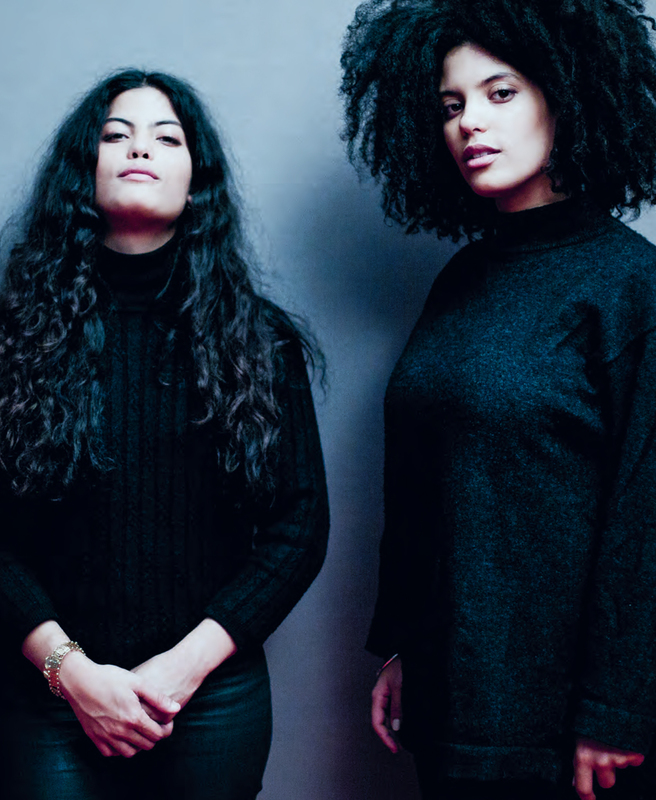 Ibeyi, the French-Cuban duo of twin sisters Lisa-Kaindé and Naomi Diaz, fuse Latin jazz, traditional Yoruban chants and minimalistic hip-hop production, which means they follow in the footsteps of their father, the late Buena Vista Social Club percussionist Miguel “Anga” Diaz. Here, Ibeyi explains Yoruban spiritual traditions and optimal forms of sibling communication. Chanting plays an important role in your music, which hovers somewhere between musical cultures: African, Cuban, American R&B, to name a few. When was the first time you heard chanting? And what does it mean for you? LISA-KAINDÉ: Probably when we were still in our mother’s womb. She was initiated into the Yoruba religion when she was pregnant with us, and chanting is an important part of that. See, being initiated is a little like getting baptized or like being born a second time. It’s a religious purification process. NAOMI: It’s a very long ceremony that takes one full week where you have to take part in different rituals. There are a lot of things you have to do in that week to align and connect yourself—with the gods, for instance. It’s a religion that was brought over to Cuba by slaves from West Africa. LISA-KAINDÉ: We are initiated in Yoruba, too, as was our father. I am the daughter of the sea, and Naomi is the daughter of the jungle. But we don’t practice it every day. We don’t worship or pray a lot. It’s more a way of thinking and seeing life as something mystical and living with the awareness of being connected to something bigger, a bigger force, like nature, mother earth or the universe at large. Honestly, I don’t believe in gods, though. As a religion, Yoruba has also been politicized in Cuba to some extent, just like other religions in other countries. I don’t like that very much. NAOMI: Me neither. For me it’s more about knowing that all of nature is alive and that you can communicate with it. So how does a traditional chant end up in one of your songs? NAOMI: [Pretends to go through a book] …Hmmm, maybe this one. No, this one? LISA-KAINDÉ: We know them by heart anyway. That’s why they come so naturally. I start with some chords, a melody and the rest just comes—or not. If it doesn’t come to me, then that’s fine, too. There is no unwritten law that we have to include Yoruba chants in every song. It has to come naturally to me, otherwise it’s not right. NAOMI: Sometimes we write the lyrics with our mother, who is also our manager. Or with our uncle. Well, he’s not actually our uncle, we’re not related by blood, but we still call him that. LISA-KAINDÉ: Sometimes I have a song and lyrics, but I have the feeling that I haven’t expressed what I wanted to say properly. Then I will play the song to my mother and tell her what I want to say, so she can help me with it. Sometimes she comes up with her own lyrics and I start to make music for them. The same goes for our uncle. You were born in Cuba but you grew up in Paris, right? LISA-KAINDÉ: Yes, our parents separated when we were very young. We moved with our mother from Cuba to Paris when we were two years old. LISA-KAINDÉ: —because we were attending a lot of ceremonies and were in choirs. How often do you go back to Cuba? NAOMI: Once a year. Our family has a house there, and we have a lot of friends in Havana. Do you prefer one place over the other? Cuba and France are two very different countries. LISA-KAINDÉ: I think we need both to be happy. We’re very different when we’re in Cuba. Naomi always says that she feels more free over there. For me it’s more about my body—it changes. The way I walk, for instance. But also my thinking is different. NAOMI: In Cuba I can live with nothing. We don’t have hot water or electricity in my grandparent’s house, for instance. I like that. But I couldn’t live like that in Paris. NAOMI: That’s a privilege obviously. For people who live there the situation is very different. We’re lucky enough to have both worlds. I imagine you could say that where we find freedom, they experience scarcity. LISA-KAINDÉ: It’s all about being more closely connected to nature. If I eat fresh fruit in Cuba, they actually have taste. You can feel the energy. It’s a special place with such a rich culture. At the same time, I love that you can have access to everything within seconds in Paris. You have museums, theatres, music conservatories. It’s easier here to bloom and become successful. You can do everything in Cuba too, but you have to really want it. It forces you to be extra passionate and persistent. You know, our father came from nothing and he became one of the most revered musicians in the world. Now that the US embargo has partially ended, a lot might change. NAOMI: Well, the majority in Cuba wants change, but at the same time, a lot of people are scared, too. Let’s see what the future brings. But I think it’s a good thing that the US stopped the embargo after fifty-six years. My friends don’t know what they’re in for, though. They don’t know what capitalism is. They just want to be able to use iPhones, buy clothes, wear gold jewelery and pose like hip-hop stars. LISA-KAINDÉ: No, that’s not what they want. They want the original American Dream: To be able to build yourself up from nothing and make a lot of money doing it. In Cuba you can be the best doctor in the world, but you’re still going to be poor. Young people in Cuba want something else. That’s understandable. But do Cubans also see the American Dream as a kind of scam? NAOMI: It’s all very contradictory. I don’t think people are prepared for capitalism and how it will affect them. Take bus drivers in Havana for instance: If they want to drink a coffee, they stop the bus and go drink a coffee, even if the bus is full with passengers. If you do that in Paris you would get fired immediately. NAOMI: Not so long ago, to be honest. Three years, maybe? Lisa started to write music and one day she told me that she got an offer to release an EP, and I was like: “You’re not going to make an EP without me!” And Lisa said: “No, I won’t.” So we started to work together. It didn’t go so well, at first. We are very, very different in everything we do. So we were fighting the whole time. We still do. LISA-KAINDÉ: But we realized when we went on stage together for the first time that music is the ideal way for us to communicate. What happened to the original EP? Was it ever released? LISA-KAINDÉ: No. Just before it was scheduled to be released we got in contact with XL Recordings and decided not to put it on the Internet. How did you meet Richard Russell from XL? NAOMI: …he was the one. LISA-KAINDÉ: Within a month we started recording. It all went very fast. We were only 18 years old. I was at university, but I had to quit and then my music school kicked me out, because we were playing too many shows. From then on it was music only. It was really frightening. I cried for two weeks. I wasn’t sure if I wanted to be a musician. But when I came to the XL studio, I realized, yeah, this is what I’m going to do. Life chose for me. Music was always there, and my father was this amazing musician who toured the world, but I like it calm. I’m a quiet person. I always thought that I would be a music teacher, teach my classes everyday and then just go back home to my family and live a quiet life. That’s something I love. But life chose a different path for me, which isn’t calm at all. I realized the opportunity was like a train that wasn’t going to pass twice. Did your sound evolve while working with Richard Russell? NAOMI: Yes, a lot. He was a great guide, helping us to explore so many possibilities without telling us what to do and what not do. LISA-KAINDÉ: He definitely changed the way we listen to our songs and perceive sound in general. We didn’t have a clue about sound. He opened our ears to every little detail. We tend to listen to music like producers now. We didn’t know what an MPC was or any other machine. We just knew that we wanted to produce the music on our own without other musicians and to use electronic elements to combine all the things we love musically: Latin jazz, hip-hop, African music. But we also wanted something organic. Silence is really important to me. I’ve always said that silence is music. I really believe in that. It creates intensity, and music is about balance. It’s all about dynamics. Dynamics in volume is one reason you get goose bumps from music. You want to feel that your spirit is leaving your body through the music. This article originally appeared in the Spring 2015 issue of Electronic Beats Magazine. Click here to read more from this issue.